- variable seeing made scheduling difficult. - the night was cut short at 03:30 when we had to close due to high humidity. Another night lost to rubbish weather. Could not open again due to... you got it. High humidity. Others: Steve C debugging SALTFIRST from CT. Paul R and Keith to check on PDET. Night lost to high humidity. Another night lost to fog. Very stable conditions throughout the night. Solid 99% humidity. Did not open. Mostly clear night with a scattering of small clouds every now and then. Mostly clear night with thin cirrus and at times good seeing. First semi-automated dithered SCAM observations using grid pattern taken tonight. clear for most of night with 2-2.5" seeing. => Clear night with some cirrus and poor and variable seeing. Many technical problems as well. => Clear night with good seeing. => High humidity all the night. => Requested 3h tests for the Frame Transfer mode were done. => High humidity, wind, rain and snow finally. No observations tonight. => Heavy clouds, rain and high humidity all the night. => Very unstable night with high humidity and clouds finally. Were closed at about midnight.
. No observations tonight: clouds and high humidity.
. Bright, clear night with high wind and variable seeing. Lost a few hours at the beginning and end due to technical problems. RSS was limited to one slit again tonight. There is a piece of aluminum along the edge of the SALT shutter that attaches material to prevent rain from entering the dome. 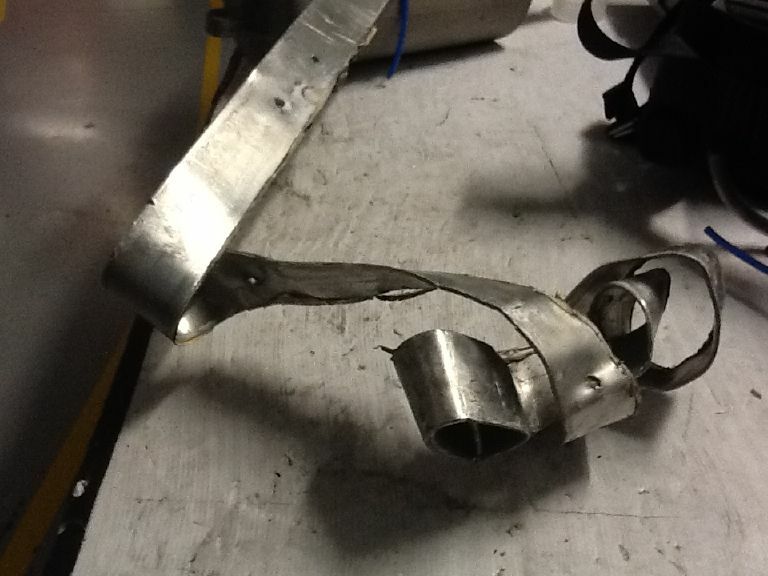 That aluminum piece used to be straight. Until tonight. Tech Ops quickly removed the mangled piece of metal (see photo below) and fixed the shutter so that we can work through the night and hopefully close up safely in the morning.
. Clear, bright night with good to mediocre seeing (1-2"). An hour+ lost due to a broken part on RSS, but great support from tech. ops allowed us to observe the remainder of the night.